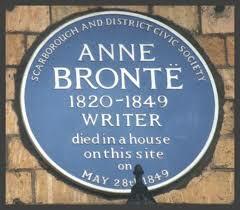 As the moors were to Emily Brontë, the coast was to Anne Brontë. A thing of beauty, a force of nature that spoke of eternity and hope, a showcase of nature’s unfeeling power. 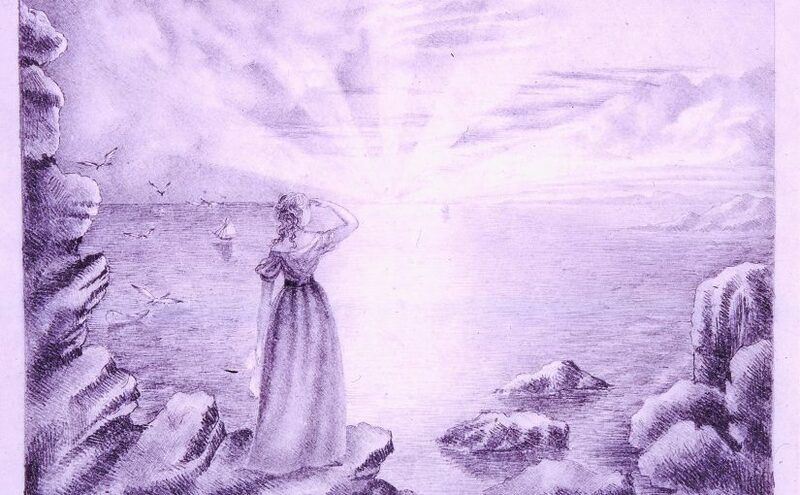 The sea haunted Anne’s imagination even before she had seen it in person, as shown by this drawing she completed in November, 1839. This is a picture that represents a confident Anne, full of hope for the life that lies ahead of her. Although she’d had a relatively short stint as governess to the Ingham family of Mirfield at this time, it was a new post with the Robinson family of Thorp Green Hall, near York, that was finally to give Anne a glimpse of the sea that she was dreaming about. Every year the Robinsons spent an extended period in Scarborough, in the North Riding of Yorkshire. Scarborough’s glory may have faded a little today, but at its time it was a very fashionable resort visited by the well to do and the aristocracy. The town is built upon two bays, and it’s also rather hilly, with a steep climb from the beachfront to Wood’s Lodgings where the Robinsons and their governess Anne stayed. Anne found that the coast was all she had hoped for and more, and her journeys to the resort from 1840 to 1844 were among the happiest moments of her life. Such an impression did the resort, and the crashing, spraying sea make upon her that she also included it in both Agnes Grey and The Tenant of Wildfell Hall (although it is never named explicitly in either novel). It was also to Scarborough, and the sea, that Anne’s thoughts turned in the last weeks of her life. Anne was diagnosed with terminal consumption, what we call tuberculosis, on January 5th 1849, and there was one place above all others that she wished to visit: Scarborough. It may have been because she loved the place so much that she wanted to see it one final time, or that she wanted to spare her father the pain of having to bury her so soon after he had buried Branwell and Emily Brontë. It may also have been that Anne wanted to ‘take the cure’, which is why many people travelled to the resort. Scarborough, like nearby Bridlington, is a spa town, and it was said that the waters had curative properties. Certainly we know that Anne bathed in the spa during her final days, and whilst there was no hope of a complete cure she may have hoped it would rejuvenate her and prolong her life. The Grand Hotel now stands on the same spot as Wood’s Lodgings, and has a blue plaque in memory of Anne Brontë on its wall. Let’s take a look at Anne’s picture again, painted ten years earlier. Anne in the middle gazing upon a glorious sun, a boat bobbing near the beach. This picture of a glorious sunrise at the start of a woman’s life, has now becoming a picture of a glorious sunset at the end of her life. Some people have said that the picture may be a copy that Anne made of an earlier picture, an artistic exercise. I once discussed this with Ann Dinsdale, head curator at the Brontë Parsonage Museum in Haworth. In her opinion this is an original work, as there are no other pictures known that are like it, and women at that time were encourage to paint and copy still life rather than figurative work. What is certainly true is that it represents Anne Brontë’s love of the sea. If we visit Scarborough today, and gaze down at the sea, we see the same crashing waves she saw, hear the same sounds she saw, and we can become just as in awe of nature’s majesty as Anne Brontë was. I hope to one day travel to Scarborough, just to see the same sights that Anne did. Great article on her love of the sea and its importance to her.